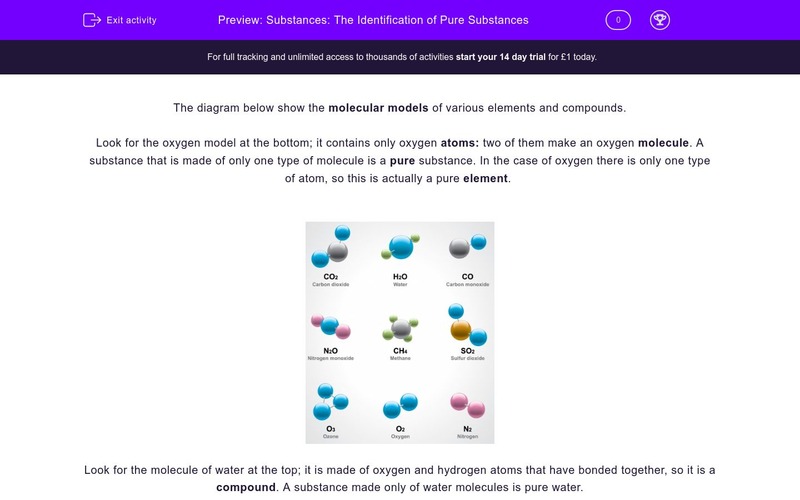 In this worksheet, students will learn about what constitutes a pure substance and how to distinguish between pure substances and mixtures. This worksheet should be followed by Separation Techniques to find out how mixtures can be separated into the pure substances they are made of. The diagram below show the molecular models of various elements and compounds. Look for the oxygen model at the bottom; it contains only oxygen atoms, two of them make an oxygen molecule. 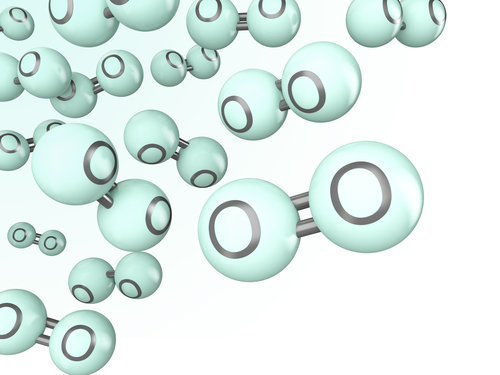 A substance that is made of only one type of molecule is a pure substance. 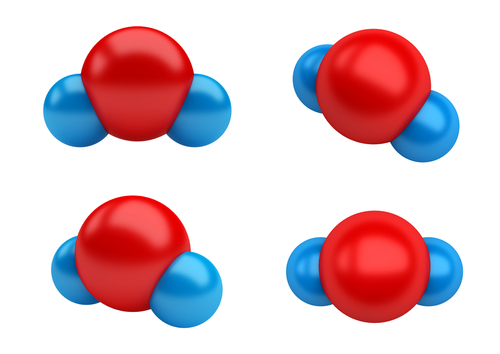 In the case of oxygen there is only one type of atom, so this is actually a pure element. Look for the molecule of water at the top; it is made of oxygen and hydrogen atoms that have bonded together, so it is a compound. A substance made only of water molecules is pure water. Seawater, on the other hand, is not a pure substance; it contains salt molecules dissolved in it, sand and seaweed. Seawater is a mixture. This means the water and salt molecules have mixed with each other, but they have not reacted (like in compounds), so they can easily be separated, if we let the water evaporate. Furthermore, we are not usually able to see the sand in seawater, but if it settles a bit, we can see the sand at the bottom of the container. This is because sand does not dissolve in water. A pure substance in chemistry is different than a pure substance in everyday life. For example, an orange juice may be advertised as pure, but for a chemist, orange juice is a mixture of water, sugar, citric acid, vitamin C and other nutrients. In order to identify a pure substance you need to look at how many different elements and/or compounds it is made of. If it only contains one type of element or one type of compound it is a pure substance. Is the substance modelled in the image an element, a compound or a mixture? Is the substance modelled in the image a pure substance? In a container you can find the two types of molecules below; is this an element, a compound or a mixture? 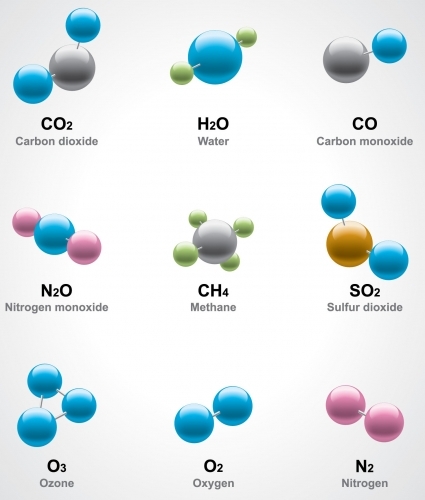 Air is made of oxygen, nitrogen, hydrogen, argon, carbon dioxide and other substances. Is air a pure substance? 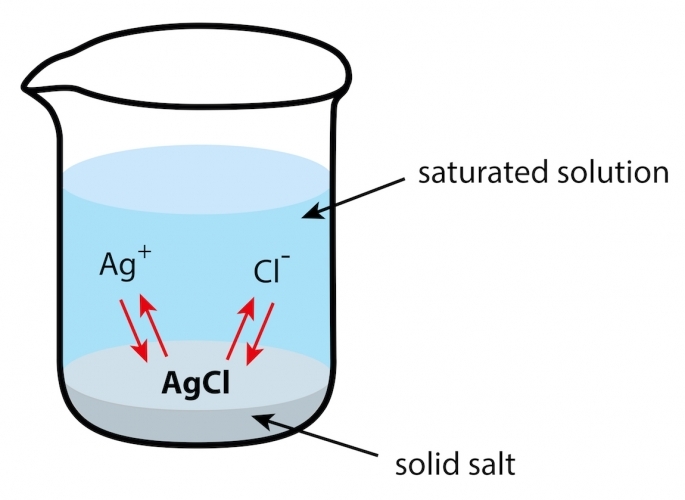 The image shows a mixture of silver chloride (AgCl) and water. Is silver chloride dissolved in water? Try the following experiment at home with the help of an adult; dissolve one teaspoon of sugar in one cup tap water. Then boil some water in the kettle and pour the same amount of water in the same cup. Be careful not to burn your skin. Try to dissolve the same amount of sugar again. When were you able to dissolve the sugar faster? How can you separate the salt from sea water? Let the water and air react. Salt will be produced. Let the water evaporate and collect the salt that will remain after all water evaporates. Pour the seawater through filter paper. Salt will remain in the paper, whereas water will go through. Boil the sea water to make it evaporate faster and collect the salt that will remain after all water evaporates. 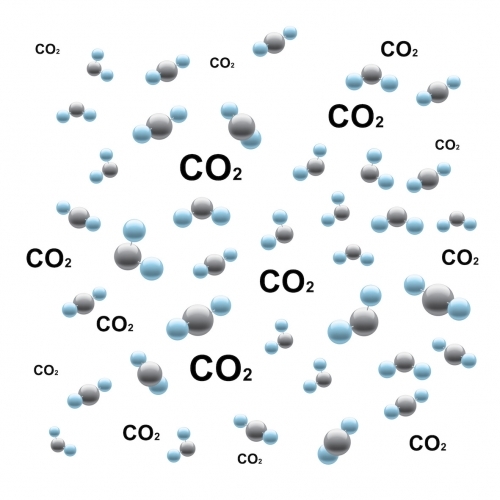 This substance is made only of carbon dioxide molecules; it is a compound. This substance is made only of carbon dioxide molecules; it is a compound and a pure substance. This substance is made only of oxygen atoms bonded together in oxygen molecules; it is an element and a pure substance. 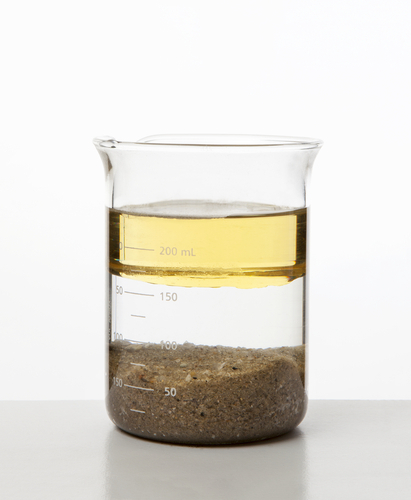 This substance is made of water, oil and sand; it is a mixture. This substance is a mixture. It is made of two different types of molecules mixed together but not chemically bonded. Air is not a pure substance; it is a mixture of all those elements and compounds. No, clearly silver chloride is deposited at the bottom of the container; it has a very low solubility in water. Provided that the same amount of water and sugar were used, it is faster to dissolve the sugar in hot water. You can separate salt from sea water by letting the water evaporate or boiling it to make it evaporate faster. The salt will remain after all water evaporates. Salt particles are very small, so they would pass through the filter paper. Do Habitats Change Every Day?